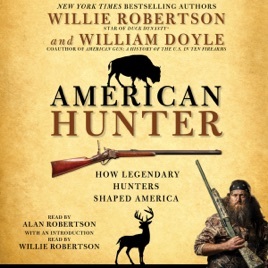 New York Times bestselling author and star of A&E’s Duck Dynasty, Willie Robertson, teams up with William Doyle, the bestselling author of American Gun, to share the history of America’s most well known hunters. America was created by hunters, trappers, and mountain men. As Teddy Roosevelt put it: “The virility, clear-sighted common sense, and resourcefulness of the American people is due to the fact that we have been a nation of hunters and frequenters of the forest, plains, and waters.” And Willie Robertson and William Doyle think it’s about time we honor American hunters by telling their incredible stories of skill, courage, survival, and downright bodaciousness. Perfect for anyone who loves hunting, sport shooting, wide-open spaces, and is interested in the amazing tales that are part of the history of America, this rip-roaring collection of true stories is perfect for sharing around the campfire after a long day’s hunt. Chronicling the great hunters of America—beginning with the Plains Indians and moving through legendary hunters like Daniel Boone, Davey Crockett, Kit Carson, Buffalo Bill, Teddy Roosevelt, Ernest Hemingway, Lyndon Johnson, and more—American Hunter honors the heroes and traditions that have built America.